The way I prolong summer blossoms is by taking pictures of them. (I'm a sucker for a perfect flower.) But another fabulous way to make them last longer is by pressing/drying them and then turning them into crafts and decor. Here are some super easy projects any of us can do. None require any fancy equipment, but if you're an overachiever and want to make a flower press, check out this article at Fine Gardening, which also describes the tried-and-true 'book' method. It also give a list of flowers that press well. For those of us impatient souls, check out the 'microwave' and 'iron' method for pressing/drying flowers on BHG. Now for the projects. Beth tells us how to embellish glass bottle and jars with pressed flowers. 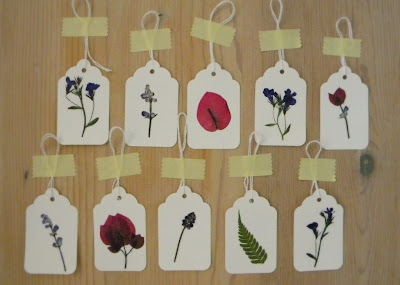 Carolyn made the prettiest gift tags ever with her pressed flowers. Basically, she just glued them onto the tags. Get a head start on Easter eggs by drying flowers this summer! Loving these pressed flower tea lights too. The flowers take center stage in these art pieces. Go to Lowes to get the details. Could You Live in a Wheel House?